Modern Buddy : My little Metropolitan! Posted: Sun Nov 09, 2014 12:22 am Post subject: My little Metropolitan! Way back in 2011, I bought myself a little red 2009 Honda Metropolitan. I was so afraid to ride it when I first bought it, but I got braver and braver and eventually joined up with a riding group, and started really stacking the miles up on my little Metro. Last September, however, I fell in love with the Buddy 50, and wanted to get one so badly. My soon-to-be ex-husband, however, said we didn't really have room for me to have two scooters - we lived in an apartment complex at that point, and didn't exactly have a good place to put multiple scooters. 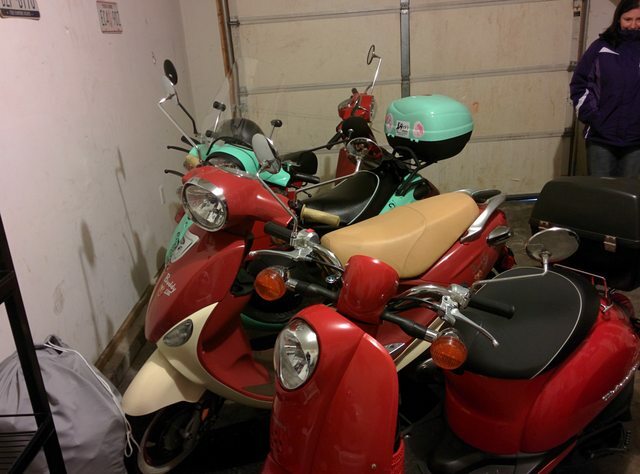 So, I ended up trading my little red Metro in (I may have cried when I rode her in for her final ride) for my seafoam green Buddy. And I love my Buddy. Mia takes me everywhere, although she hates running in the winter. I fell in love with the noisy two-stroke scooter, but I still missed having my Metro around. So late this past summer, I started shopping around, looking for a new-to-me Metro, and not really finding anything that suited what I was looking for (in good shape, within a reasonable price range, with title and everything). Then my soon-to-be ex sent me a message the other day - he works at my local scooter shop and told me he had some news. Apparently the guy who bought my little red Metro wanted to sell it, and he told me he wanted to get in touch with me to see if I was interested. And I was. So today, I brought back home my little Scooterlou, my first ever scooter. It's gonna take some getting used to, riding her around after 1800 miles with my Buddy over the past year, but now I've got both my favorite scooters, and I couldn't be happier. Whoo wee! I am so happy for you and I hope this will be me in a few months too. I may be getting my little red Met back soon too. When I sold it a year ago I asked the buyer to contact me if she ever wanted to sell it to upgrade to a bigger scoot. As recently as a month ago she told me she is looking for one and would I still want my Met back? Yes! So there is a very good chance I will get "Squirt" back soon too. Here's hoping! She was not my first scooter, but has special sentimental value to me and was one of my favorite 50cc scooters. Ooooh, that's an awesome coincidence! I'm so happy you'll be getting Squirt back too! There's a lot of sentimental attachment to Scooterlou, and I may have rushed downstairs like a kid on Christmas morning today to check the garage and make sure she was really there, haha. Glad you go the Metro back. Which of you scoots was a two stroke? Buddy 50, Metros are 4 stroke. One last picture of my little Metro - this time, with new decals and a snazzy seat cover from Suzy at Cheeky Seats! It's good to have my Metro back. I like that look! Very sharp! And isn't that basket just the most wonderful thing? Congrats on getting your Met back! I'll never get my first scooter back, but at least I still have the scooter that got me back in the game. I love my beat old '87 Elite 80, no matter how slow she is and how dodgy the suspension is. I've just about completed a full overhaul on her engine and will be pulling the Tupperware to clean and service the frame, suspension and electricals next. Spent more than she's worth in new parts alone, but it's crazy what a love of little scoots will allow you to do. But here's a pic of 'Archie' and I heading out for a ride one cold day. 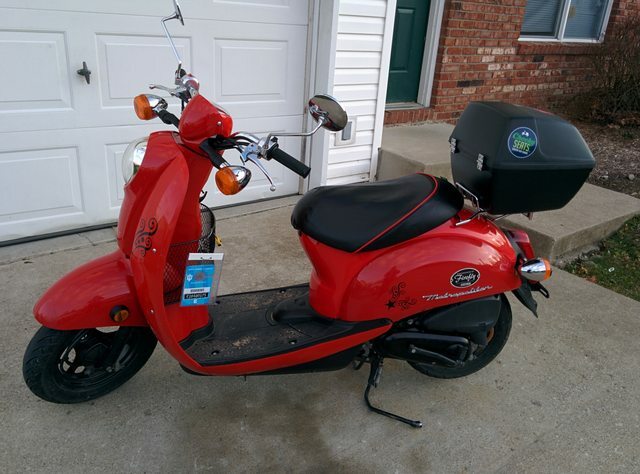 My first ever scooter was a 2006 metro (red & white)... And loved i, even though I went 25mph on any hill... I had it for four months before trading in for a 125 Buddy...and even today after 2 more scooters and now a motorcycle, there are still times I wish I still has that lil go getter. Gang, it is looking like I will get my Met back mid-April! Its current owner contacted me earlier this week and said they will be upgrading to a bigger scooter and the Met is "all mine"! I can't wait! It's like a long lost relative is coming home! Crazy, my love for that Met! I am still waiting to get my Met back! I have given up on getting my original Met back. The people kept stalling and then became non-communicative. I think they just did not want to sell it and should have just said so. I AM going to look for another Met, C3, or Ruckus though. Jingles needs a companion! Well, I never got my 09 Met back and wound up with another C3 last June. Budgetary restraints led me to sadly sell it and my Elite 110 in February this year and I was scooterless for awhile. Then in May I found a used 2002 Met with 718 miles on it, in mint condition, at a dealership 5 miles from me. They held it and let me pay on it 'til I got it out last week. Ironically the people who had my 09 Met contacted me AGAIN, but I already had my Denim awaiting pick-up. Turns out in almost 3 years they had only put 100 miles on it. Sad and then they'd never gotten back to me before so pfooey them! So I have a Met back in my life, Crafty! I will post a pic later. There's nothing like the love of a Met. 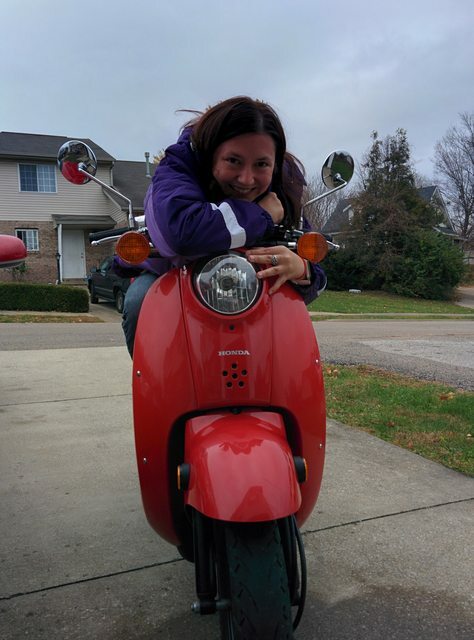 Fits me like a glove and I love this scoot! That's a nice red colored scooter.